When Dyson introduced their Air Multiplier fans back in 2009, I was intrigued by the concept of a fan that replaces the traditional spinning blades with loop amplifiers. 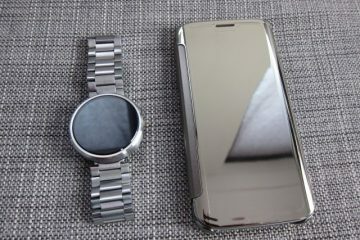 The result was indeed not only elegant and futuristic, but also quite pricey, costing several times more than a conventional fan. There was no denying that it also looked a lot better too. Two years later they introduce sort of a hybrid product, combining both their previous rethinking of the fan while going one step further by adding a heater into what is now called the Dyson Hot. I was quite excited to put the Hot through its paces to get a feel of how the Air Multiplier technology works, but also to see how the technology copes with the added functionality of a heater and most importantly to find out if it could replace the traditional fan. 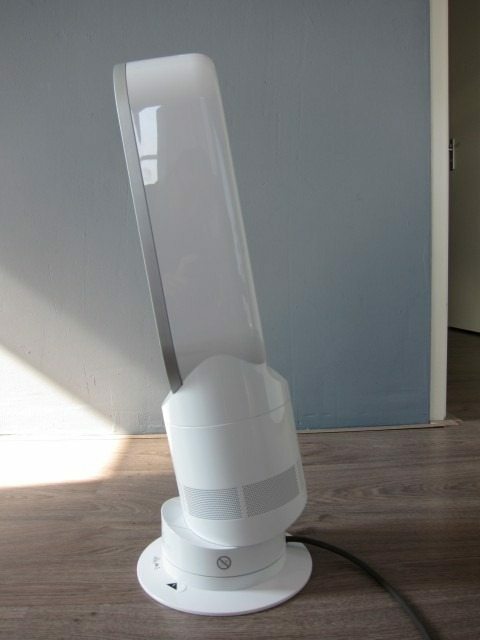 This review is based on a long term usage of the Hot during the past wintery months and will try to answer the question: Is it just a stylishly designed piece of tech or could Dyson’s latest be a legitimate replacement for the 100+ year old fan? 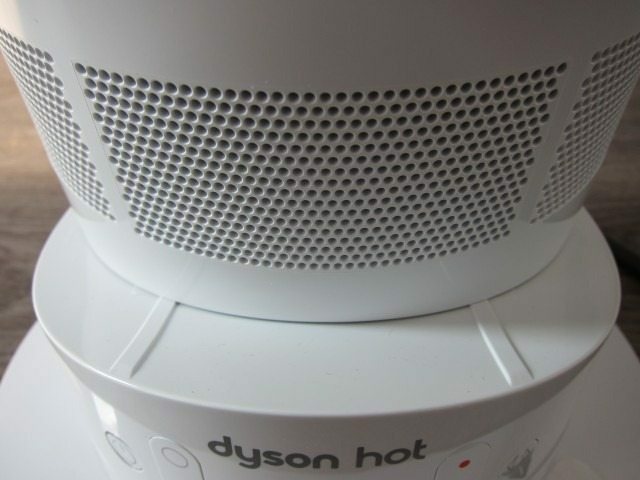 The Dyson Hot fan heater AM04 is as the name suggest a hybrid between a traditional fan and heater, but judging by the design alone, there’s nothing traditional about the Hot. The way it creates air flow is even more radical. The AM04 uses Air Multiplier technology to efficiently produce airflow. It basically takes surrounding air via the openings in the base and pushes it out at high speed through slot that runs along the sides of an elliptical loop called the Amplifier. The magic happens once the air streams out where it encounters a curved surface, which naturally creates negative air pressure. This pressure causes the outgoing air to accelerate while drawing even more air from the back. As the air travels down the expanding ellipse, it creates another area of low pressure behind the fan which again automatically pushes even more air through the fan and causing the air in front of it to accelerate even faster. 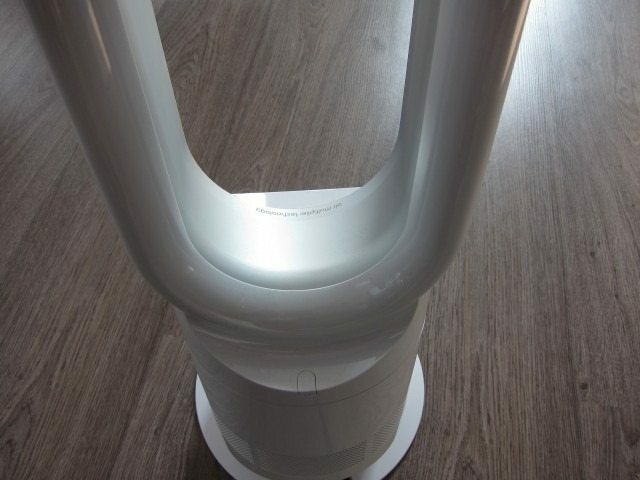 Lastly as the air exits the fan as a large cylinder of air that comes of the edge, more air is added through a process called viscous shearing. 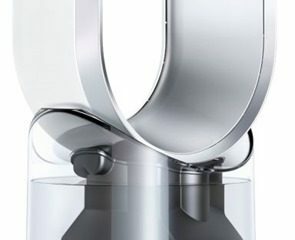 Dyson’s approach is simply genius and efficient in the sense that the fan is designed in such a way to naturally create low pressure areas. This all comes down to using the laws of physics to accelerate the air, drawing in lots of air from the back with very little initial effort. The concept is pure brilliance! 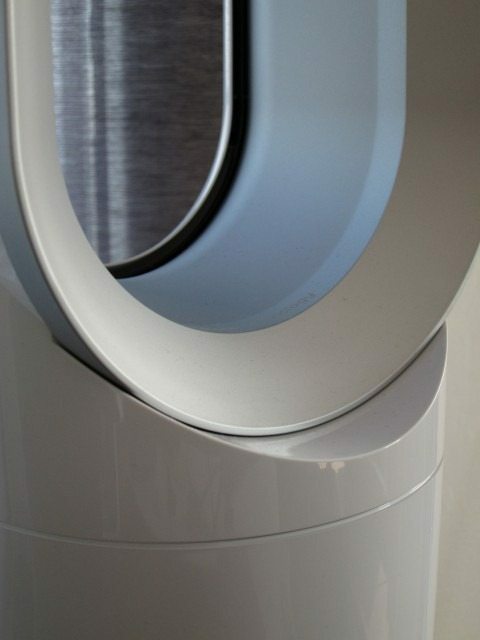 The Hot is a heater first and a fan second: While it happens to be the only Air Multiplier machine that’s able to heat a room and function as a fan, its performance as a fan does take a backseat to the heater function. 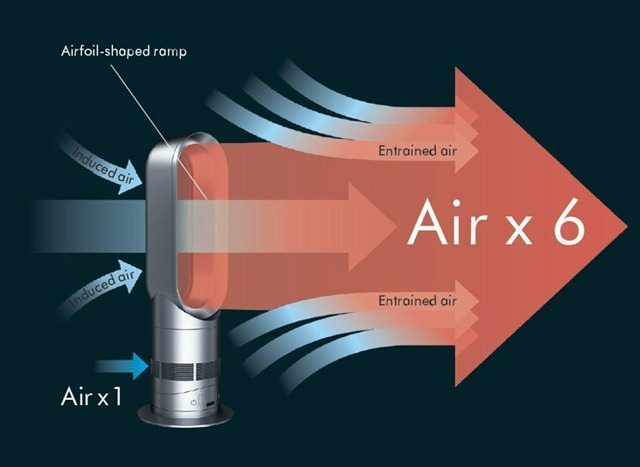 This means that the other Air Multiplier fans will easily outperform the Hot when it comes to the ability to accelerate (or multiply it as Dyson likes to call it). The regular fans can “multiply” the incoming air anywhere from 15 to 18x, while the Hot is only able to do this at 6x. There are probably two reasons for this. The first is that they actually needed less multiplication, otherwise the Hot wouldn’t be able to heat the hair fast enough and as a result , wasting energy in the process. The incoming air from the back needs to slow down a bit for it to effectively heat the entire column. Secondly, when it comes multiplying the air, the elliptical shape simply is less efficient than the round shape found on the AM01 or AM03 . 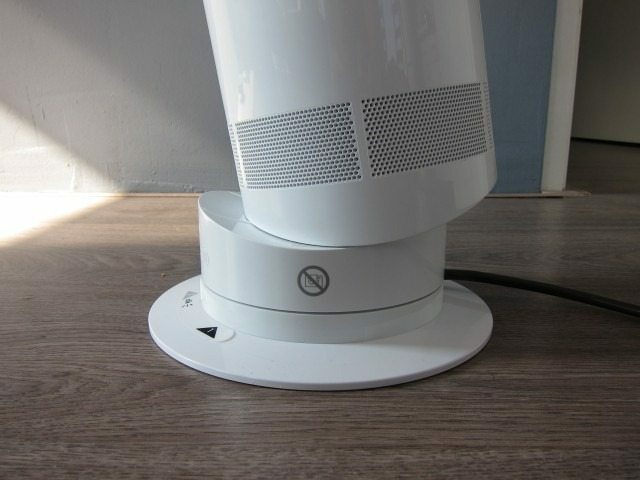 Just look at the AM02 Tower fan (with its elliptical shape). 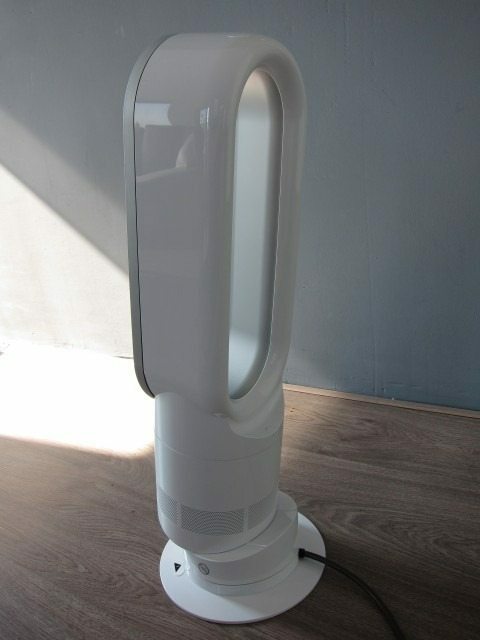 It’s able to accelerate the air at 16x, while the circular-shaped AM03 Pedestal Fan does this at 18x. 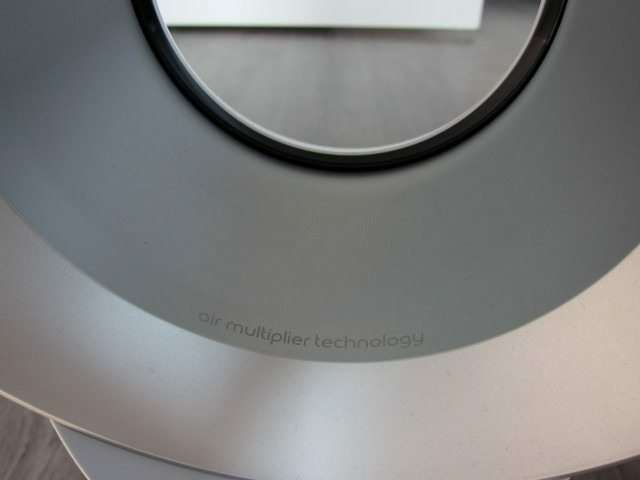 So how is the Hot positioned in Dyson’s line of Air Multiplier devices? A flagship device usually is the most expensive and feature-packed product in a particular line. 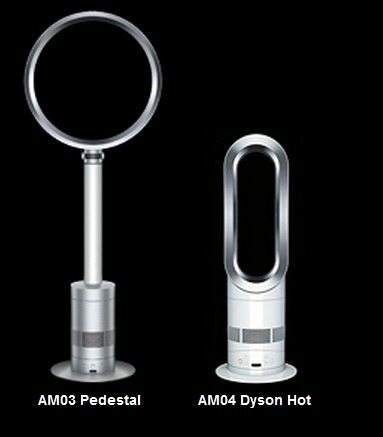 One look at the AM04 name would have you believe that the Hot is Dyson’s flagship Air Multiplier. This is based simply on the fact that the higher number usually means the better the product. Add the fact that the Hot is the only Air Multiplier with both the fan and heating functionally and you’d definitly think it’s Dyson’s flagship device. The Hot is actually part of a separate line of hybrid devices that have both the fan and heating functionality, while there’s a another line that consists of fan-only devices. In that sense the Hot is the flagship in the heater line, since it’s the only product in that group. 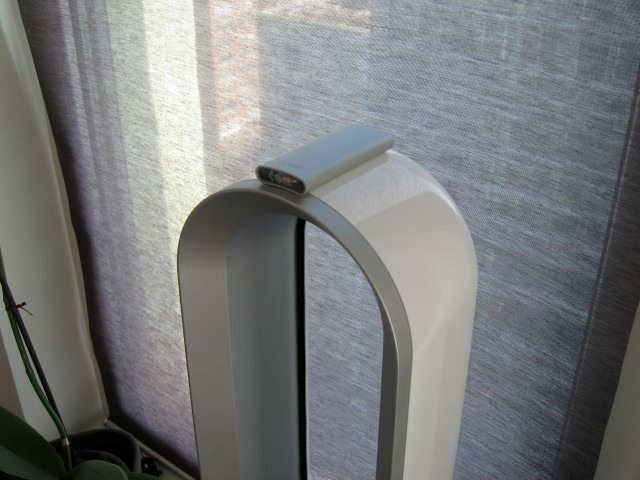 Among their line of fan-only devices, the flagship title goes to the AM03 Pedestal which just happens to be their most expensive and highest performing air multiplier device. So, depending on your definition of a flagship, being either the most expensive or the most feature-packed, that title can go to either the Hot AM04 or the AM03 Pedestal. 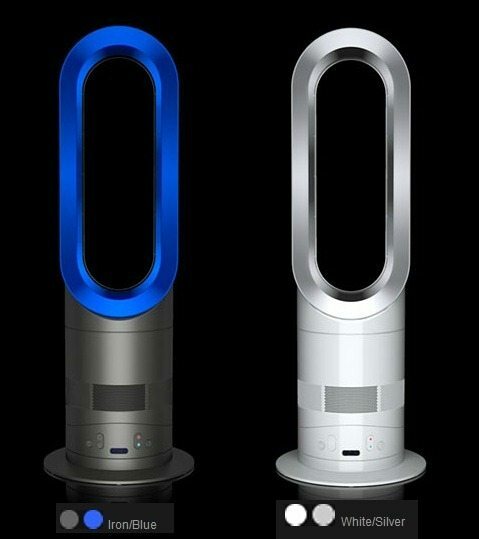 The Hot is available in two color combinations: Iron/Blue and White/Silver, with both being offered at $399.99. I was send the White/Silver version that matched the Grey and White color palette I used in my apartment exactly. With it’s neutral color palette, I think that version should work well with most modern interior designs. The Iron/Blue is a beautiful color combo but isn’t very neutral which could make look a bit out of place in many homes. Dyson should consider offereing the Hot in a full Iron and full Black color options. I suspect that there is a market for these color, especially if they made a full Black version. Let’s get one thing straight, the Hot is one beautifully designed piece of tech. It’s design is very distinctive and even if you don’t know what it is, you’ll have to stop and take a second look. For those that do know what it is, it’s instantly recognizable, leaving no doubt that you’re looking at a Hot. 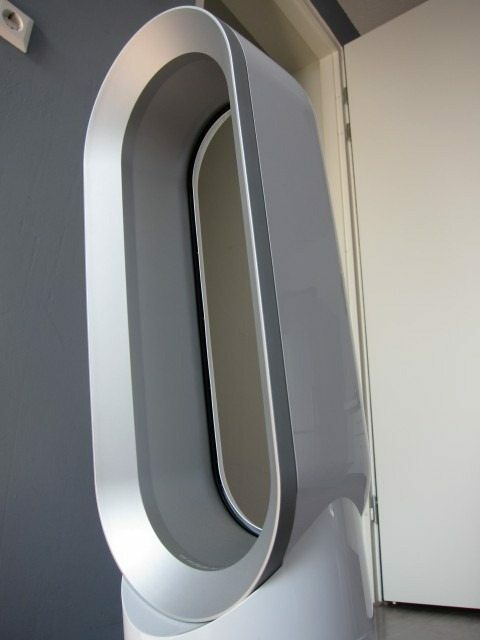 Like many Dyson and Apple products, the Hot will surely be remembered for its iconic design and radical departure from the traditional device it replaces. If it wasn’t for the fan and heating functionality, the Hot could easily be mistaken for a stylish piece of modern art. As a result, the Hot doesn’t have a problem blending in with the rest of the décor and in my opinion even adds to the overall interior design. Just as interesting is the reaction from visiting friends and family to the Hot. Unable to determine what it does, they always start by asking what it is, followed by comments on the how beautiful the design is. Lastly, once the confusion sets in, they always end up asking how it works. The Hot is one of the those rare devices that’s not only able to attract lots and lots of attention, yet manages able to fit in nicely with the rest of the furniture and décor. Just ask any wife how much they love those new large tower speakers in the living room. The Hot on the other hand will easily get the wife approval. 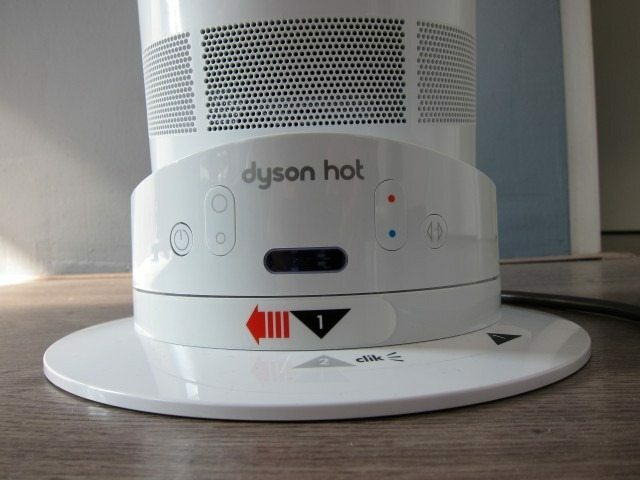 The Hot looks like a smaller version of the floor standing the AM02 Tower Fan, retaining the same elliptical ring Dyson calls the “running track shaped” amplifier. This shape was chosen to take up limited desk space. 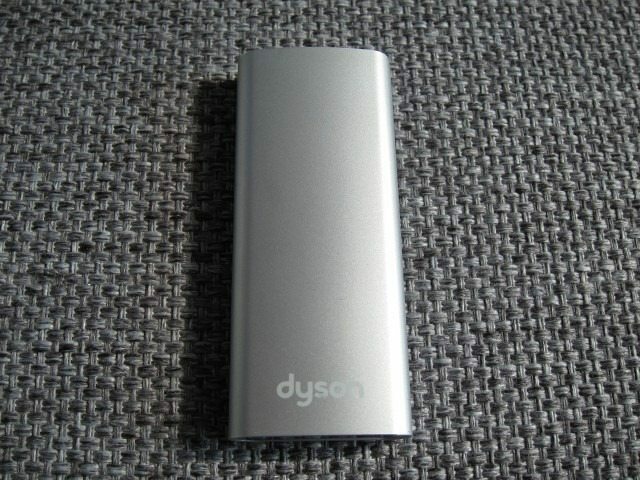 In comparison to the other Dyson’s fan it requires the least amount of space due to its slim profile, with the base being its widest element. Even when it’s fully tilted forwards or backwards or when oscillating, it never reaches beyond the borders of the base. 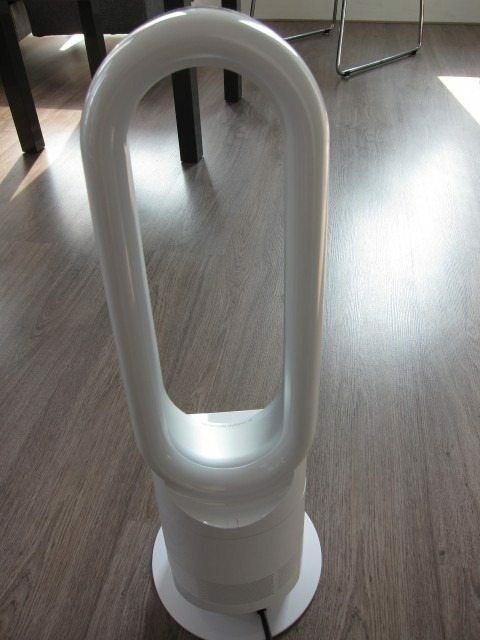 This allows the Hot to fit in some very tight corners which is a big plus when compared to wider traditional fans or even the other Dyson fans. 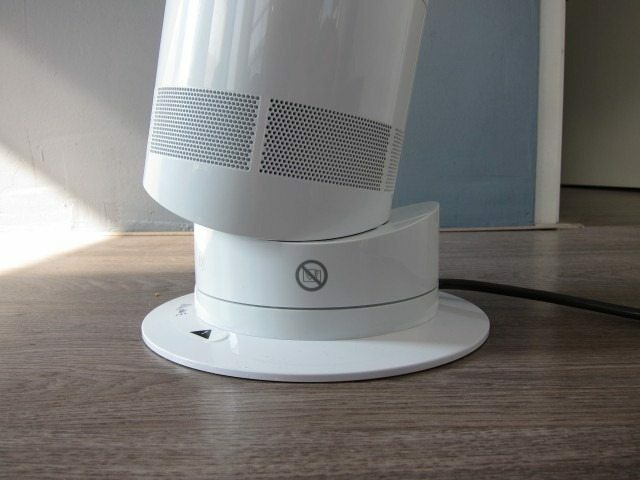 The unit consists of the large elliptical ring, called the Amplifier, the pedestal and the removable base. The only assembly required is twisting the base into place to connect it to the Pedestal. It seemed easy, but I found it a bit difficult to properly align the lines and screw the base into place. Points have to be given to the folks at Dyson for at least trying to make the process incredibly easy with arrows and symbols indicating exactly what to do. But when it came down to actually attaching the base, it definitely wasn’t as intuitive or easy as it should be. After several minutes I finally got it right, something that should have taken mere seconds. I also tried removing the base, but that was even worse. After trying for a few minutes, I finally decided to simply give up. No matter what I did, I simply could not get it off. If there is one area that needed improvement, it should be this detachable base. Dyson should simply go back to the drawing board and permanently attach this to the body or make it much easier to attach and remove. Luckily this is a one-time thing and will probably remain attached to the body. The base itself isn’t very wide, but is enough to add all the stability needed. Despite being very tall and narrow, the Hot is aided by its low center of gravity and the base. As a result, the Hot is surprisingly difficult to topple over. Even when in what seems like a gravity-defying tilted position, it remains very stable. The pedestal is divided into two halves, making tilting possible. The lower part houses all the controls and buttons: the Power button, Thermostat control, Airflow speed control and oscillation control. One very cool detail is the LED lights that indicates the temperature and airflow speed. It uses matching White lights that nicely fit the rest of the glossy White finish. Once turned off, they completely disappears, leaving an area that’s no different from the rest the glossy White body. A very nice and elegant touch. Small and thoughtful details like this are scattered all around the Hot, clearly indicating how much thought and effort went into the product. 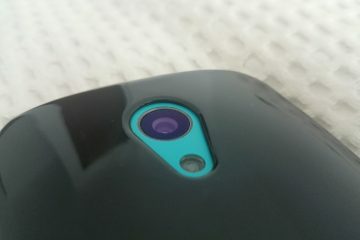 The receiver is located below the display, where there’s an opening covered by a clear cover. It appears to be using IR and doesn’t require an exact straight line-of-sight or a close proximity. It operate just fine at large distance and even when slightly pointed to the sides. This doesn’t mean that a large couch won’t hinder operation, because it does. 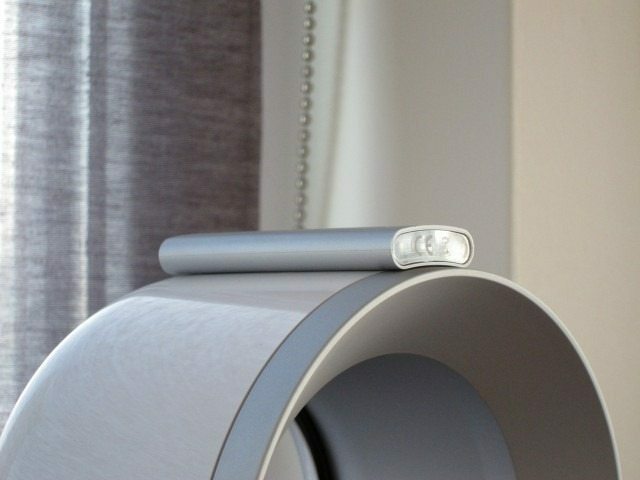 But considering the typical placement of the Hot between furniture, Dyson should consider using RF technology. This way it can even be operated from different rooms, while obstructions like large furniture won’t have any effect. 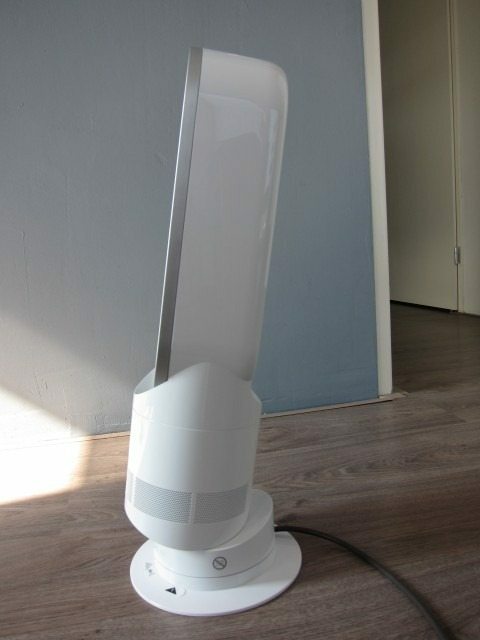 The lower part of the pedestal allows for the entire unit to swivel. The upper part allows the Amplifier to be tilted, allowing it to direct air downwards or upwards. The sliding action is very smooth and requires very little effort. 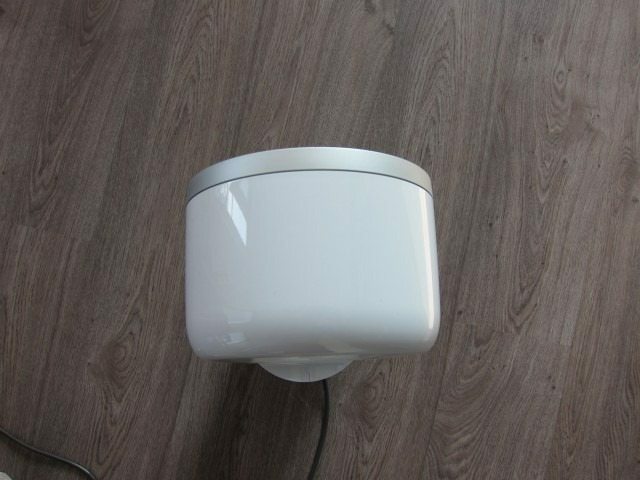 It doesn’t have predetermined stops, but allows you to position it at any specific locations without any unwanted movements. The entire sliding mechanism feels incredibly solid. The only possible way Dyson could make this better is by making the tilt function mechanically controlled. Tilted forwards or backwards, it looks like it’s about to come crashing down at any moment, but instead seems to give the illusion of doing a gravity defying balance. The first time I tilted the Hot, I had to stop for a few seconds and just admire how cool this looked. It really looks like it’s being suspended by some magical force that prevents it from falling over. This feature doesn’t only serve the purpose of directing air upwards or downwards, but also adds a very interesting visual element to the Hot. The upper part of the pedestal houses nothing but the grilles through which air is drawn in. The amplifier is de piece de resistance and is probably the first thing you’ll see when looking at the Hot. It sits a bit sunken into the pedestal and is silver on the inside and glossy White on the outside. At the back of the Amplifier there’s a slot that runs along its entire perimeter. This slot is where the heated air is pushed out. This heating is done by heating stones embedded in the Amplifier. I think it’s these heating elements that make the Amplifier walls on the Hot thicker than those found on the much larger AM02 Pedestal. 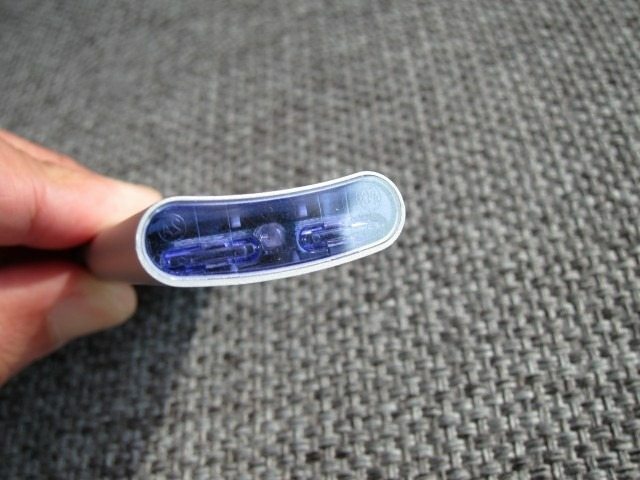 While it looks like the air comes out along the entire perimeter, it actually only comes out of the straight part of the slot and not through the curved areas. The Amplifier is bit more narrow in the back and slightly widens in front. There are many small, almost unnoticeable elements that appear to be insignificant or just there for the aesthetics, but are actually key in the process of accelerating the air. Take for example the slightly raised area just in front of the slot and the slight widening of the amplifier that help in creating two different low pressure areas. Many electronic devices with an emphasis on design seem to sacrifice utility in favor of design. In this case it’s exactly the opposite: the unusual shapes and every tiny detail seems to serve a purpose, yet at the same time it all comes together in package that scores high when it comes to the aesthetics. 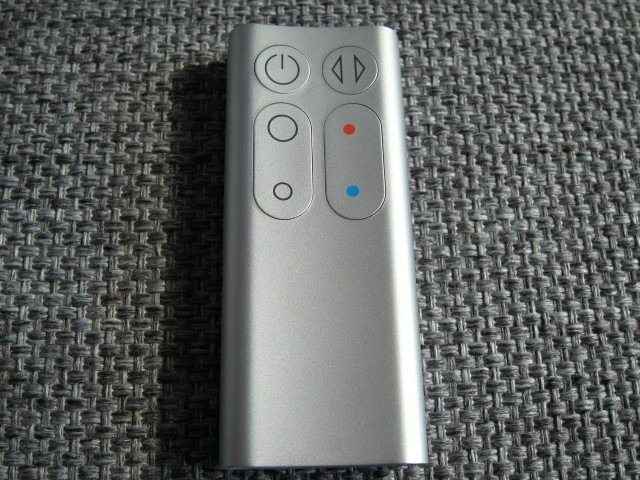 The remote looks like a larger and longer third generation iPod shuffle and appears to be made out of Aluminum. One closer look reveals that it’s actually plastic. The quality, fit and finish on the remote is high enough to fool you into thinking it’s metal. I had to take a very close look to make sure it was plastic. It also never gets cold, something that obviously would happen if it was Aluminum. The exact same controls on the pedestal are mirrored on the remote. The buttons sit completely flush with the body with no raised area to actually tell you’re pressing a button. The problems comes when sitting in the dark where it becomes difficult to operate. 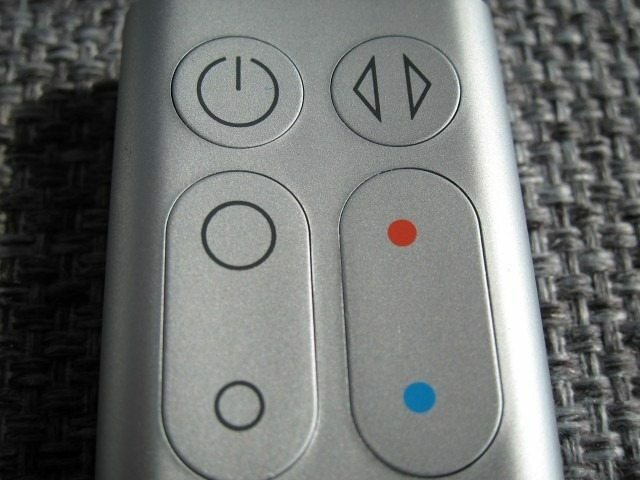 I’d love it if Dyson would put backlit buttons on future versions of this remote. That would make operation in the dark a whole lot easier. The use of a light sensor would also aid with conserving power. One neat detail is that the remote can magnetically attach to the top of the Amplifier, creating an unusual, again almost gravity-defying visual effect. The top of the Amplifier is round and very glossy, putting the remote here looks like it will slide and come crashing down. As you get closer it reassuringly snaps into place by using magnets. It’s also handy to have a place where you can put the remote and come back and find it. We all know how remotes tend to mysteriously disappear. It’s thoughtful details like this that show the amount of thought that went making the Hot and at the same time it’s visually an interesting detail. One part I consider to be a negative is the use of disposable batteries in the remote. Sure, it will take a while before it needs to be replaced, but at this point in time it’s simply environmentally unacceptable. I think Dyson should keep the remotes ability to be magnetically stored on the Hot, but add inductive charging similar to devices like the Powermat. 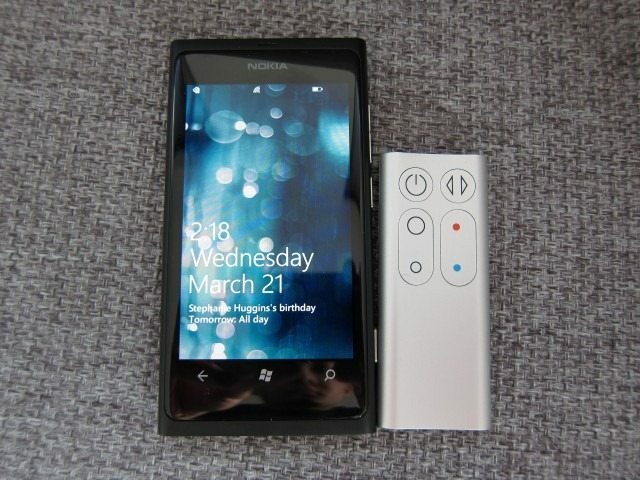 This way the remote can charge up while docked on the Hot and most importantly no more disposable batteries! This method is not elegantly fitting for a device such as the Hot. Dyson engineers, if you’re reading this, get to work and get it done! Working with the Hot is very simple. When you set it to 0, the power button will turn Blue and the Hot will operate like any normal fan. But if you set the temperature anywhere from 1 to 37 degrees Celsius the button will turn Red, indicating that it’s running in Heater mode. Do notice that the temperature scale will vary by region: our European version for example uses Celsius while our US-based readers can obviously expect Fahrenheit. On the US version setting the temperature to 32 degrees will activate fan mode. How does the Hot fair as a heater? Once you set it to a specific temperature it will produce hot air trying to maintain the entire room at this heating level. If the room is already at that particular temperature (or higher) it will simply stop running and go into some kind of a stand-by mode where it continues to monitor the room temperature. I love this feature, because this prevents the Hot from running all the time wasting energy, but it also takes away the hassle from having to remember to turn the Hot Off when the room is at the desired temperature. Once it drops below the specified level, the Hot will turn back On and repeat the entire process. It’s that simple. I also like the fact you can precisely control the temperature which is something I’ve rarely seen on modern portable heaters. It’s actually entertaining seeing the Hot turning itself On and Off trying to manage the room temperature. In some cases it would turn Off (indicating that it reached the desired temperature), but just seconds later it would turn back On. This to me indicates that the Hot is very sensitive to slight variations in temperature which could trick it into unnecessarily turning itself back On. This doesn’t affect its performance or the room temperature, but it can a bit odd seeing it turn Off and then shortly after turn back On. While the Hot is very efficient at managing the temperature, it is perhaps a bit too sensitive when it comes to these minute temperature changes. 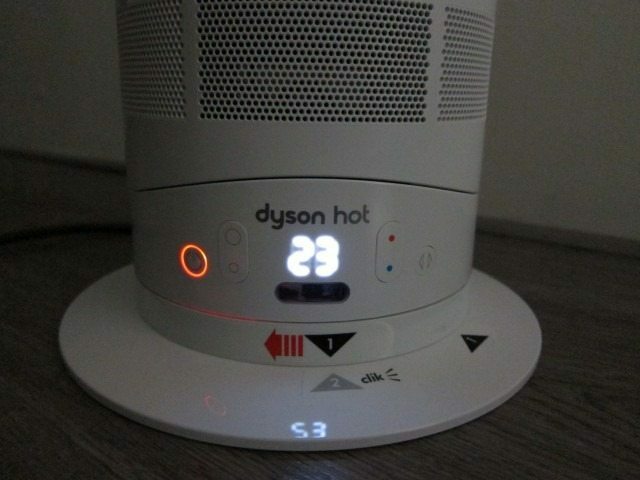 This doesn’t affect its overall performance, but it’s perhaps an area that Dyson should slightly tweak. The Hot is no slouch when it comes to heating performance where it really impressed me with its ability to quickly produce hot air in less than a minute, indicating its ability to rapidly heat the stones inside. More impressive was the fact that it managed to do this from a cold start. Specifically when oscillating and running at close to the max air speed it was able to quickly heat my entire living room in about 10 minutes, something my floor heating system could never achieve. The fact that this was done from a relatively small machine is even more remarkable. You really start to see the benefits of the Hot on those cold days where you come home to a cold room and you’re able to quickly to heat it up. The same can be said when just want to keep a small area like your feet or just a reading nook warm. To achieve this local heating affect, all you need to do is lower the air speed. A higher air speed setting has the tendency to spread the heat around and heat a larger area. After a cold start, the Hot actually starts blowing unheated air which can be a bit uncomfortable during the Winter months. One cold morning for example it was quite painful getting a sudden jet of cold air, just before it started producing hot air. This happens because it obviously needs to heat the stones inside, before it’s able to heat the air. I wish the folks at Dyson would reprogram the Hot in such a way that it wait until the stones are fully heated, before it starts producing air. This isn’t a deal breaker, but it definitely requires a reprogram to change this uncomfortable aspect. Once the stones do heat up however, it quickly makes up for this with a gloriously warm and comfortable stream of air. As you know, the air can get very dry during the Winter and having a product blowing hot air with relatively low humidity can have a drying effect on the skin. 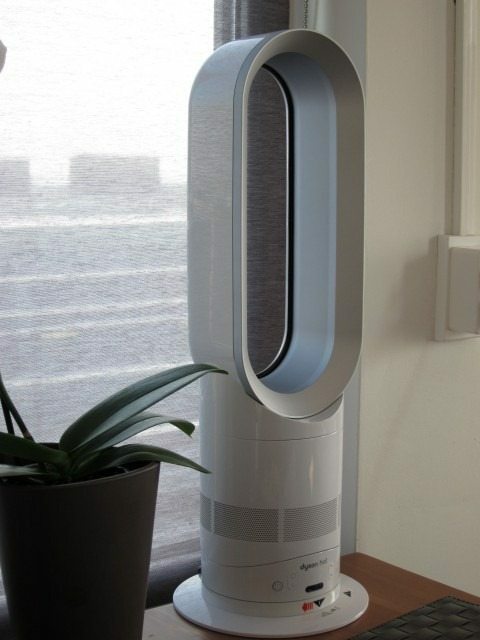 This can easily be alleviated by having a separate air humidifier, but it would be interesting if the folks at Dyson could integrate humidifier function into the Hot. 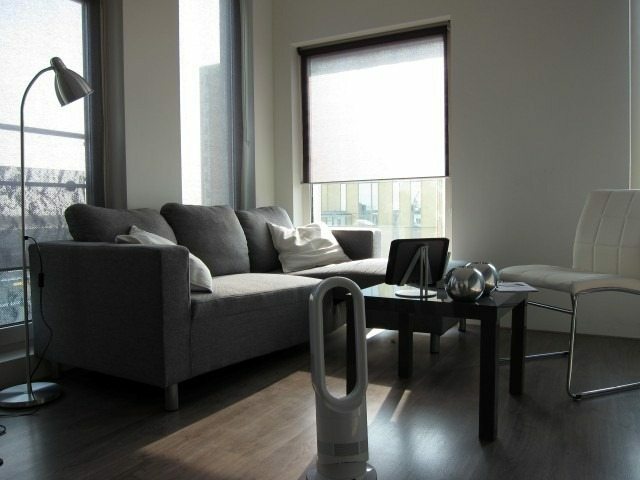 It’s already producing Hot air and spreading it around your entire room, why not add humidifier into the process? When running in Fan mode, the Hot is running at peek multiplication and even so it isn’t as quick as the other fans. My guess is that elliptical shape is less efficient at producing air when compared to the round shape. I don’ consider this to be negative point, as it’s a heater first and a fan second. 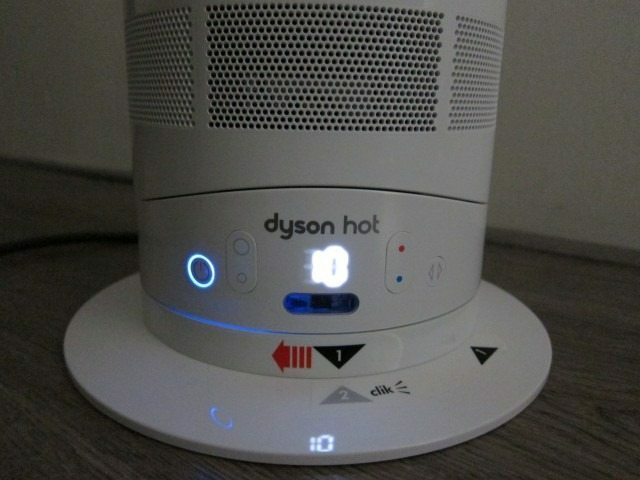 To give you an idea, the Hot multiplies the air at about 6 times, while Dyson’s lower-end desk fans do this at 15 times! At 15 times the air would be going by so fast, it simply wouldn’t get the chance heat it up. Unlike conventional fans, you can safely put your hand in the middle of the amplifier, making it very kid friendly. If you put your hand behind or right in de middle of the ellipse you won’t feel any air. It’s only when you stand in front of the Hot you are you greeted with a constant and smooth column of air. The effect is very different from a standard where you can feel a very choppy, unstable air. The air feels more like a constant breeze, with no perceptible turbulence. The When in heating mode I was able to put my hand on the inner parts of the elipse without any problems. It was hot, but not uncomfortably hot, while the outside remained cooled to the touch. It’s only when you put your fingers near the slots where the hot air exits the fan, does it get uncomfortably hot. It never gets hot enough to burn you, which is a plus. There’s a neat hidden feature where the Hot will turn itself Off if you knock it over. I tried gently knocking my sample of the Hot over on a pillow and it completely turned off. Even when I tried turning it back on by using the power button on the unit it wouldn’t turn back On. It wasn’t until I set it to its normal upright position was I able to start it back up. As a fan the Hot works quite similar to when in heating mode. But unlike the heating mode, you can’t set the temperature, but you do have control over the airspeed. One thing you’ll notice is that while running in Fan mode, the multiplication process works a lot faster, producing significantly more air. It works great as a fan, but compared to other Dyson fan it is a few steps behind, being able to only do 6x multiplication, compared to the 18x on the AM03 Pedestal. If you’ll mostly be using the fan function, my advice is too look at the other Dysons fans which have a higher air mulplication rating. 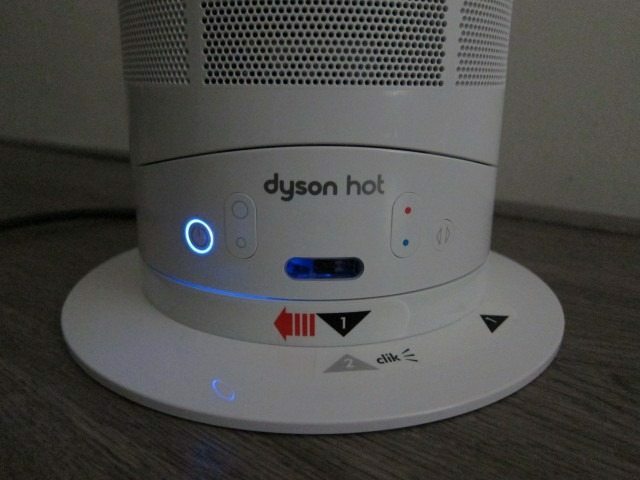 But as it stand, the Hot is still a impressive heater and a good fan, but not as good of a fan as Dyson’s other model. One thing to consider is the sound produced by the Hot: it can be described as a gentle “whooshing” sound that’s a bit different then then the sound produced by a conventional fan. At max speed, the Hot is quite a bit louder, but It’s still within I would call the comfortable zone. Most potential buyers won’t have any problems with the sound produced by the Hot, but there will be a small group that simply won’t like. The motor sitting in the pedestal is silent, but it’s actually the air exiting the slot that produces this whooshing sound. The air speed can be set anywhere from 1 to 10. Anything above airspeed level 8 is a bit too loud for me. I do hope that in future version, Dyson improves on the technology to cut down on the noise level. The beauty of the hot however comes from the fact that you can set it at the lowest levels where it doesn’t seem to produce much air, but more importantly produces this strange and very relaxing cooling effect. 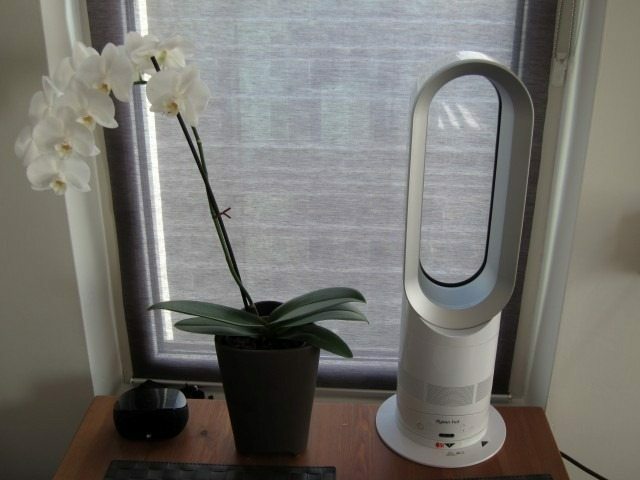 As a fan the Hot is a few steps behind Dyson’s own fans, yet exceeded my expectations. The sound is different and at max volume a bit loud, but at the lower levels it’s much smoother than a fan where it’s able to create a more effective cooling effect. The Hot is a remarkable piece of tech that combines an eye-catching design with functionality. It’s one of those rare devices that stands out while still being able to blending in with the rest of the décor and in my opinion even adds to the overall interior design. If it wasn’t for the fan and heating functionality, the Hot could easily be mistaken for a stylish piece of modern art. Small touches like the magnetically docking remote control, gravity defying tilt function, its ability to shut off when knocked over show and the LED lights that completely disappear when turned Off, show the amount of thought that went into designing the Hot. However I had a bit trouble attaching and removing the base and using a disposable battery for the remote at this stage is environmentally unacceptable. Due to the fact that the buttons on the remote sit flush, I sometimes wish they were backlit. Working with the Hot is very simple. You set the desired temperature and it does the rest, even shutting down to conserve power and turning back On to maintain a stable temperature. The Hot is no slouch when it comes to heating performance where it really impressed me with its ability to quickly produce hot air in less than a minute, indicating its ability to rapidly heat the stones inside. More impressive was the fact that it managed to do this from a cold start. Specifically when oscillating and running at close to the max air speed it was able to quickly heat my entire living room in about 10 minutes, something my floor heating system could never achieve. The fact that this was done from a relatively small machine is even more remarkable. You really start to see the benefits of the Hot on those cold days where you come home to a cold room and you’re able to quickly to heat it up. As a fan the Hot works great, but the sound produced is a bit louder than a normal fan and can be described as a gentle “whoosh.” Most will be ok with the sound, but some simply won’t like it. The Hot is a legitimate replacement for the fan, with the added bonus of a beautiful design, while thoughtful little details seal the deal. 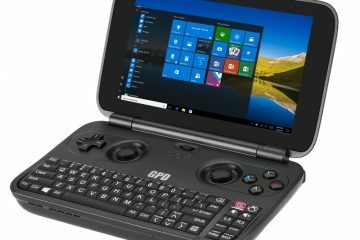 The $399.99 price might be a big hurdle for many, but you do get what you paid. I simply love the Hot. It gets an 9.7 out of 10. How do u clean it? Where the air intake is? Does the Dyson dry the air. I noticed mention of heating stones but no other mention of the method used to heat the air/stones. Will it heat and dehumidify a basement family room?